The UTAX smart solution from UTAX, a registered trademark of TA Triumph-Adler GmbH, is professional Managed Document Solutions (MDS) software for specialist retailers and SMEs. The UTAX smart appliance securely captures all of the usage data and error reports from your printers and multifunctional, regardless of type and manufacturer. UTAX smart provides retailers and customers with easy access to everything they require via a Web browser or mobile device. This means full cost and usage transparency for companies and central administration thanks to the continuous optimization of the output infrastructure by the specialist retailer. UTAX smart provides administrators with constantly updated information on user behaviour and the costs and benefits of the installed systems. The infrastructure can be optimally adapted within a short period of time if use no longer matches real-life requirements and workflows due to business developments or staff turnover. 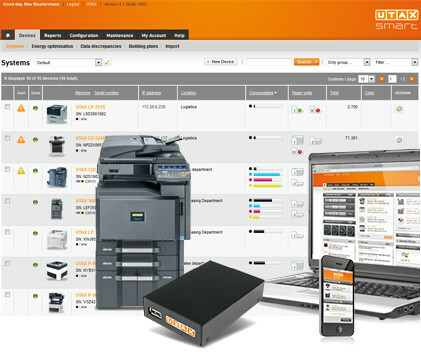 A system overview, adjustable to the workflows of your customer, shows all printers, copiers and fax machines in the company – irrespective of the manufacturer and the type of electrical connection. 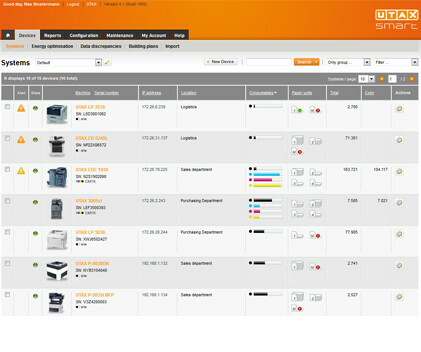 The screen features intelligent filters, so that you can maintain the overview even with several hundred systems. Status- and alarm messages provide information on the company's output systems at any time. Is the toner empty? Has the paper run out? UTAX smart thinks ahead: the suitable stopplies for the system will be displayed in time and can thus be ordered at short notice and without unnecessary storage times. Whether it is data about one single piece of equipment, or the solving of printing or copying problems – every piece of information is always just one mouse click away. Even meter readings can be transmitted from the customer to the dealer this way. With UTAX smart, medium-sized businesses save twice: direct costs, because the system procurement can consistently be optimized according to the demands, and above all, indirect costs, because the administration of all systems is being centralised.